Ready for some more Pinspiration?! This month’s Pinspired craft: Felt Rosette Grapevine Wreath with Interchangable Halloween/Thanksgiving accents. Description: This no sew Fall wreath is easy for all level of crafters! If you can cut and roll felt, and use a hot glue gun, you’re in! 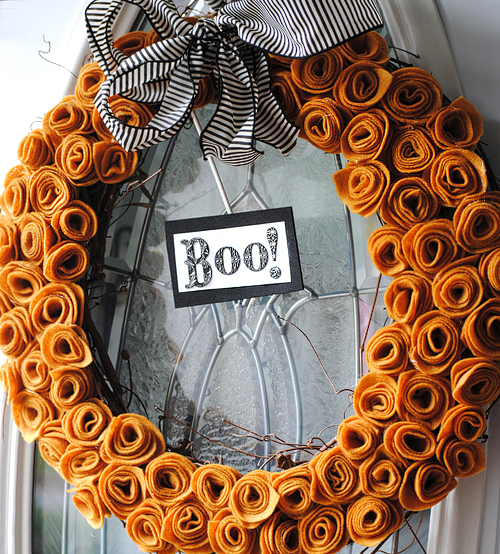 We will also make simple Halloween and Thanksgiving accents so this beauty can show off on your front door for the whole Fall season! Please register for September’s gathering. You will receive a confirmation email within 48 hours of registering. If you need to cancel, we will make every effort to sell your supplies to others at the meeting, but if we cannot please consider paying for your materials anyway. RSVPs must be submitted by Friday, August 31.